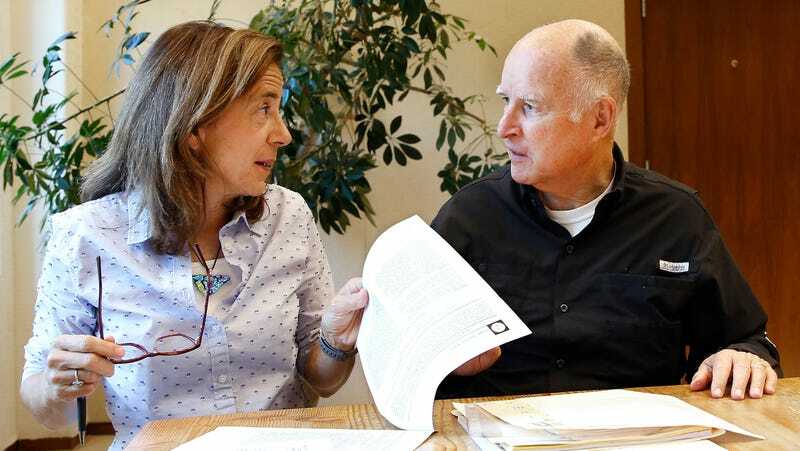 Governor Jerry Brown and wife Anne Gust Brown. California, whose beaches and progressive policies have earned it the title “The Only Good State in America” (judge and jury: me), has strengthened its sexual harassment laws, thanks to a series of bills signed by Governor Jerry Brown on Sunday. Variety reports that Brown signed the four bills known as the “Take the Lead” bills, which were championed by actors like Rosanna Arquette and Mira Sorvino in light of newfound attention paid to sexual harassment in the entertainment industry. The bills would 1) make it easier for victims of harassment and assault to pursue civil damages against their harassers after signing settlement agreements, 2) increase an employer’s liability if freelance or contract workers were harassed on the job, 3) beef up sexual harassment training, and 4) require public companies to have at least one woman board member (or more, depending on the board’s size), since studies have shown companies headed by high-ranking women handle sexual harassers much better than ones that don’t. Can’t imagine why. California is now the first state in the country to require companies to have women board members, and I can only imagine how the boys will feel about having to let a girl into the treehouse. According to Bloomberg, the state, which is notably home to man-heavy Silicon Valley, has 165 publicly traded companies without any women on their boards, and they have to start staffing up quick—the bill mandates an end-of-2019 deadline. I hear Tesla needs a new chairperson!